Awww! It's A Robot Baby Roundup! "It is exhilarating to see my dream transformed into reality: a robot child that would be reared within the bosom of a human family, raised like a human child, a brother to a human child - growing, learning, becoming an adult. I can hardly contain my excitement at the possibilities I foresee!" M3-neony has been developed to research the development of fine motor skills like crawling. Remarkably, it weighs just 7.7 pounds, about the same as a human newborn. 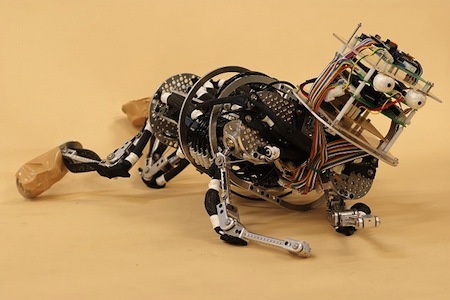 See baby robot M3-neony crawl! M3-synchy is used to understand verbal and non-verbal communication, primarily with its expressive face and arm gestures. iCub is a robot platform; the intent is to explore the development of human-style cognition. 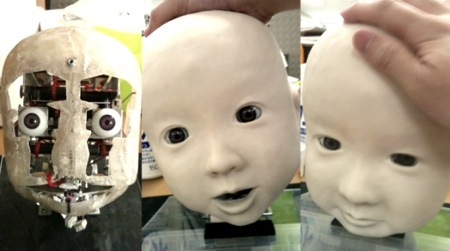 Learn more about iCub robot child also, with video. 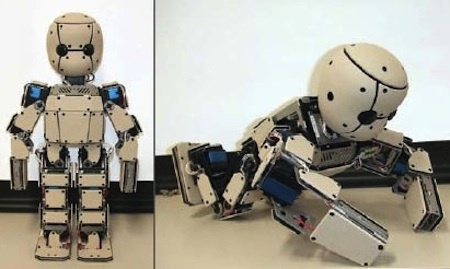 Affetto is modeled after a one- to two-year-old child and will be used to study the early stages of human social development. 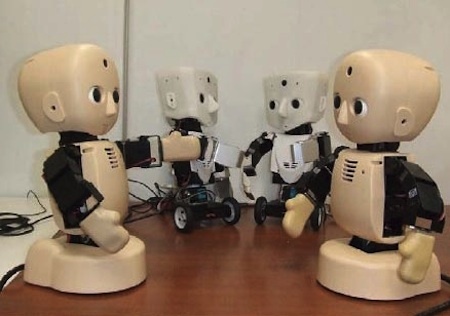 Pneuborn-7II and Pneuborn-13, two infant-sized robots, are to be presented by Osaka University’s Hosoda Lab at ICRA 2011. Their pneumatic muscles are made of soft flexible materials, letting them gently interact with their environment. "Getting a robot to act so pseudo-convincingly is largely due to the skills of the baby's, um, driver (? ), who in this case looks to be an English professional animatronic creature designer named Chris Clarke." At four months, Fitz is developing along normal lines. His little body has gone from asymmetric postures to symmetric postures, his eyes now converge and fasten on any dangling object held at mid-point. As for Mac, he is developing even more rapidly. He is beginning to learn control of his limbs: it is apparent that he will walk before his human brother. Before long, he will learn to speak; already I hear the rumbles within the cavity of the soundbox in his chest. Seen any other cute robot babies? Let me know.